Used for identification and analysis of structures of different metals and alloys, the MT-01100 inverted trinocular metallurgical microscope is ideal for research institutions, factories and educational institutions. 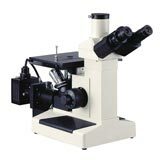 The microscope can be used for studying metallography, heat treatment, metal physics and other areas requiring high magnification and reflected light analysis. Precise Seidentopf Trinocular viewing head with 1x C-Mount adapter. Magnification range of 100x to 1000x standard. Includes LWD (long working distance) 10x, 20x, 40x & 100x(oil) DIN Plan objectives. WF 10x eyepieces, 18 mm field of view. DIN Standard Objectives. Plan, parfocal and parcentered. Extra large professional double-plate graduated mechanical stage (150mm x 180mm) with stage plate inserts included. Variable 6v 20w Halogen illuminator with blue, green, yellow filters. The MT series includes a 1x C-Mount in the third optical (vertical) port allowing a camera to be attached. 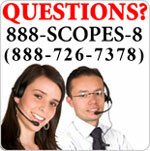 C-Mounts with other magnification lenses are also available (please contact us).